It may be popular for its unbelievable valleys, but Yosemite is much more than a valley. In fact, it is home to some of the nation’s most spectacular waterfalls, meadows, and ancient sequoia trees. Within its 1,200 miles of wilderness, visitors can find everything nature defines as beauty—wildflowers, animals grazing, crystal clear lakes, and amazing domes and pinnacles of granite. During the same time that Yellowstone became the first national park, Yosemite Valley and Mariposa Grove were recognized as state parks within California. When the National Park Service was formed in 1916, Yosemite fell under their jurisdiction. It has been used by the United States Army and even President Theodore Roosevelt has spent time camping within its borders. In fact, it is internationally recognized for its granite cliffs, biological diversity, ancient trees, and enormous waterfalls. Today, the park spans three counties and covers 761,266 acres. It is one of the largest blocks in the Sierra Nevada mountain chain and is home to a diversity of plants and animals. Yosemite helped pave the way for conservation and recognition of national parks and is one that cannot be missed. Open year-round, this national park fills up quickly on holiday weekends. You can expect to find filled campgrounds from June through August. Spring and autumn sometimes draw in more tourists, but still prove to be the best seasons to plan your trip. If you are traveling from the northeast, take Calif. 120 to the Tioga Pass Entrance. Note: This entrance may be closed during late May to mid-November, depending on the weather. From the south, follow Calif. 41 until you reach the South Entrance. Your best bet is to travel to Merced, a gateway community for Yosemite located about 70 miles away. From Merced, follow Calif. 140 to the Arch Rock Entrance. An entrance fee applies to all visitors. For a private, non-commercial vehicle, the fee is $20 and includes all passengers. This is valid for unlimited entries to Yosemite for seven days. Those arriving by foot, bike, motorcycle, or horseback will be ​charged $10 to enter. An annual Yosemite pass can be purchased and other standard passes may be used as well. Reservations are only needed if you plan to spend the night in the park. Do not miss the highest waterfall in North America—Yosemite Falls, at 2,425 feet. Choose between trails leading up to Lower Yosemite Falls or Upper Yosemite Falls, but keep in mind the latter is more strenuous. Plan at least a half day to enjoy Mariposa Grove, home to more than 200 sequoia trees. The most well-known is Grizzly Giant, estimated to be 1,500 years old. Also be sure to check out Half Dome, a massive block of granite seemingly cut in half by a glacier. Sparing over 4,788 feet above the valley, it will take your breath away. Overnight backpacking and camping is popular within the park. Reservations are required, and many permits are given on a first come, first served basis. 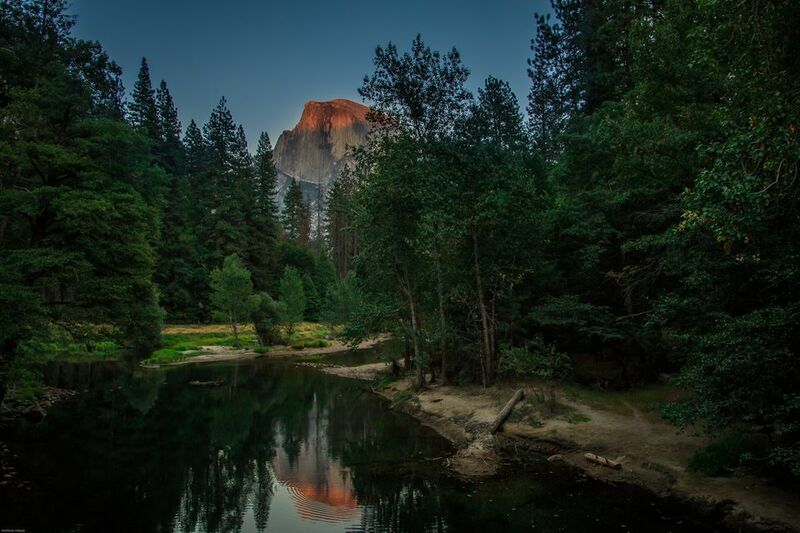 Thirteen campgrounds serve Yosemite, with four open all year-round. Check out Hodgdon Meadow from the spring through fall, or Crane Flat and Tuolumne Meadows in the summer. Inside the park, you can find many camps and lodges. High Sierra Camps offer five camps with tent cabins—fee includes breakfast and dinner. Yosemite Lodge is also quite popular for those seeking a rustic feel. Two California national forests are convenient to Yosemite: Stanislaus National Forest in Sonora, and Sierra National Forest in Mariposa. Stanislaus offers hiking, horseback riding, boating, and scenic drives through its 898,322 acres, while Sierra boasts parts of five wilderness areas at 1,303,037 acres. Visitors may also enjoy hiking, fishing, and winter sports. About three hours away, tourists can take in another national treasure—Sequoia & Kings Canyon National Park, two national parks that joined in 1943. Nearly every square mile of this park is considered wilderness. Enjoy stunning groves, forests, caves, and lakes.